Mitch Dunn is a Postdoctoral Research Fellow within the UQ Composites group, in the school of Mechanical and Mining Engineering. He has interest in a wide range of composite material research activities, including fibre-reinforced laminates, hybrid composites including fibre-metal laminates, and nondestructive testing and evaluation of composite structures. Mitch has worked within the UQ Composites group since 2010 on a diverse set of projects, from exploring the use of novel natural-fibres in composites, modelling of ultrasonic wave propagation, advanced manufacturing processes, product development and innovation, nondestructive testing and development of hybrid composite materials systems. 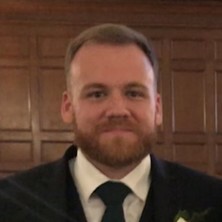 Mitch received his PhD from UQ in 2018 for his work on the detection of laminar damage in composite laminates using nonlinear ultrasonic techniques. Recently, he has worked on composite material projects with DMTC demonstrating the effectiveness of computer-assisted manufacturing (CAM) of composite tooling, modelling the structural performance of composite components, and investigating hybrid composite materials system performance. Dunn, Mitchell, Veidt, Martin, Blanloeuil, Philippe, Gunnion, Andrew and Wang, Chun H. (2014). Detection of laminar damage in composite beams using nonlinear ultrasonic modulation techniques. In: 8th Australasian Congress on Applied Mechanics as part of Engineers Australia Convention 2014. Proceedings. ACAM 8: 8th Australasian Congress on Applied Mechanics, Melbourne, VIC, Australia, (640-648). 23-26 November, 2014. Dunn, M. J., Masri, A. R. and Bilger, R. W. (2007). Lifted Turbulent Premixed Flames Issuing Into a Hot Coflow, Imaging of Temperature and OH. In: 16th Australasian Fluid Mechanics Conference (AFMC). 16th Australasian Fluid Mechanics Conference (AFMC), Gold Coast, Queensland, Australia, (1344-1349). 3-7 December, 2007. Dunn, Mitchell (2011). Application of Wavelet Parameters for Damage Characterisation in Beams B.Sc Thesis, School of Engineering, The University of Queensland.